Since our inception in 2009, The Lens has been honored in several local, regional, and national awards competitions. Losing Ground – the groundbreaking project about coastal loss combining explanatory reporting, photography, aerial and satellite imagery showing how the Gulf of Mexico had swallowed much of Southeast Louisiana over the last 80 years, and audio stories from people who had seen the land around them disappear. The Lens’ Bob Marshall reported, wrote stories, and recorded audio. Al Shaw and Brian Jacobs of ProPublica created the web presentation and designed the eye-popping interactive graphics. The Lens was honored as the best local news website in New Orleans at the 54th Annual Excellence in Journalism Awards, sponsored by the New Orleans Press Club. The Lens won two other first-place awards, for best investigative print story and for publishing the best news-affiliated blog, from our opinion writer Mark Moseley. Here’s the full story on our Press Club honors. “Despite recent practices, NOPD silent on arrest record of Samaritan killed in Algiers” – Society of Professional Journalists, 2012 National Ethics in Journalism Award winner. “Following the money: the use and abuse of Katrina recovery dollars” – Press Club of New Orleans Awards, 2011 Winner for Best Print Investigative Story. Press Club of New Orleans Awards, 2011 Alex Waller Memorial Award Winner. The Lens was also pleased to leave the 2013, 2014, and 2015 Press Club of New Orleans‘ award ceremonies with numerous awards. Environmental writer Bob Marshall won second place in the science/health/technology category in his contribution to Losing Ground. His story about the New Orleans’ flood protection system was honored as a finalist. 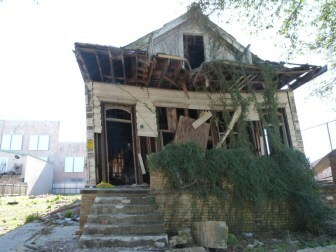 News technologist Abe Handler and staff writer Charles Maldonado took home a first place award in the category honoring web graphics and animation in their interactive map of properties, which the city listed as remediated since 2010. Not all were improved, however, and many were still in notably bad condition. News technologist Abe Handler and open data reporter Tom Thoren was second place in the innovation category for the creation of The Vault. This is The Lens’ repository for a variety of public records, including city salaries, city contracts and a continually updated list of property transactions. Two contributors to The Lens also took home first place awards. Author and urban activist Roberta Brandes Gratz won in the columnist category. She wrote an opinion piece about the controversy over a mid-rise development being planned for the Holy Cross neighborhood. In June of this year Gratz released her latest book, “We’re Still Here Ya Bastards,” which examines wins and losses by grassroots efforts in New Orleans after Hurricane Katrina. It features work by Karen Gadbois that eventually led to the founding of The Lens. Della Hasselle, a frequent freelance contributor to The Lens, won in the category of continuing coverage. For two years, she’s investigated efforts by the state prison system to secure the necessary drugs to carry out an execution. The most highly charged story, which is named in this nomination, revealed that the state lied to a Lake Charles hospital to acquire a necessary drug, telling hospital administrators that it was to be used in hospice care. The full list of winners is here. The full list of finalists is here. The Lens is proud to be a finalist in eight categories for the 2014 Press Club of New Orleans awards, including best news site, investigative writing and continuing coverage. This year’s list of finalists shows the range of our coverage: New Orleans flood protection, downtown redevelopment, lethal injection, standardized-test cheating. And it shows how we do our work differently: deep-dive stories, live blogs and live chats, documents and analysis. In addition, The Lens’ Bob Marshall and WWNO’s Fred Kasten are finalists for “Last Call,” their radio series on the disappearing coast. The awards recognize work done in 2013. Lens freelancers are well represented on the list. Included in our package about New Orleans flood protection were stories by Loyola University student Sarah Drew and Kari Dequine Harden, in addition to staff writer Bob Marshall. Those stories are a finalist for science and technology writing. We’re a finalist in the “partnership” category for our text and radio stories about the high cost and complications of busing students in New Orleans. Those stories were spearheaded by two of our freelancers, Marta Jewson and Della Hasselle. Janaya Williams, our audio producer, helped bring the story to life on WWNO-FM. And Hasselle started to cover the controversy over Louisiana’s lethal injection practices well before it was a national story. By then, she had become an expert on the subject. Our columns about the Mother’s Day shooting, written by Jed Horne, Deb Cotton and C.W. Cannon. We congratulate all our colleagues for their excellent work — particularly those at The New Orleans Advocate, Fox 8 News and WWNO, who have taken a special interest in our public-service journalism. The Lens took away three first-place awards this ceremony and several second- and third-place awards our investigative work, our redesigned website and our charter schools coverage. Local news site. The judges wrote in their comments, “Excellent site: Attractive design and intuitive navigation. Good use of social media and interaction tools, setting the tone for engagement on issues that advocate for the N.O. community.” The Lens was named best local news site in 2012, too. Second place, news affiliated blog, for Mark Moseley’s posts. Judges wrote, “Wonderful entries. Moseley’s blog intelligently discussed three different newsworthy issues in New Orleans, linking to original reporting by a wide variety of journalists.” Moseley won this award in 2012. Second place, continuing coverage, for Jessica Williams’ coverage of the troubled education nonprofit Operation REACH. Third place, use of social media by an organization, for our use of Twitter and Facebook. The Lens’ groundbreaking Charter School Reporting Corps is a finalist in the community news category. Our group of more than a dozen freelance reporters covers virtually every meeting of the more than 40 charter school boards, most of which convene every month. No other news outlet provides this depth of coverage. Our staff is a finalist in the social media category for our use of Twitter, which we use for our live coverage of meetings, and Facebook.